Anyone know how to disassemble a Corgi Gemini 2? There are no obvious screws to remove. I want to be able to remove the windows, repaint and then install the windows again. i would think you would have to drill the rivets in the base. The last corgi model i took apart was dismantled that way but it was a lorry not a bus. Yes. Corgis are a pain in the backside to dismantle, EFEs are much easier in this regard, which is probably why you see so many more EFE code 3s compared to Corgis. if the poles that hold the two halves of the model togther then that would be where to drill. Those to holes are for securing the model to the base of the box. 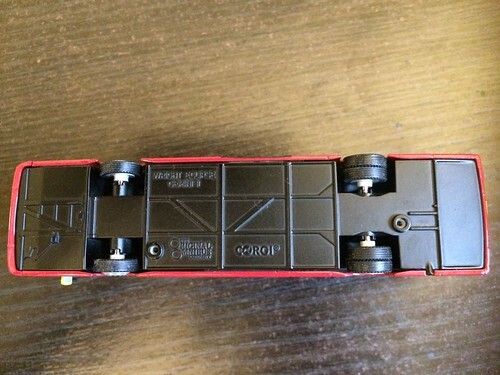 They are held together similar to Northcord models where the bumpers hold the chassis to the body and everything else slides in and the glazing clips into the body. Should I just pull the baseplate off then? I know this works for Northcord models but on this one the baseplate seems much more rock solid. The Northcord ones often have a little bit of give.